Range: Laos, Vietnam, Hainan, southeastern China, eastern Cambodia. Diet in the wild: prefers small, scattered sources of ripened, pulpy fruit, but also eats buds, young leaves and some invertebrates. Diet in the zoo: main diet is composed of small fruits. Coat color varies with gender in this species; males are black with lighter cheeks and a tuft (crest) of longer hair on his head , while females are a golden buff, some with black patches. Arms and legs are very long and slender. 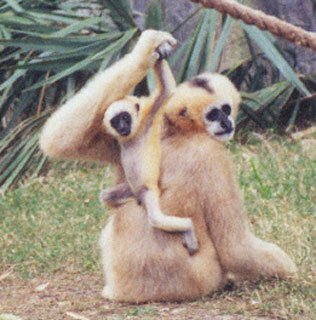 Gibbons are highly arboreal and move by brachiation, swinging from handhold to handhold under branches and vines, using their long fingers as hooks. Gibbons walking bipedally on the ground hold their long arms up in the air. The thumb is free of a palm and extends through a large range of motion. 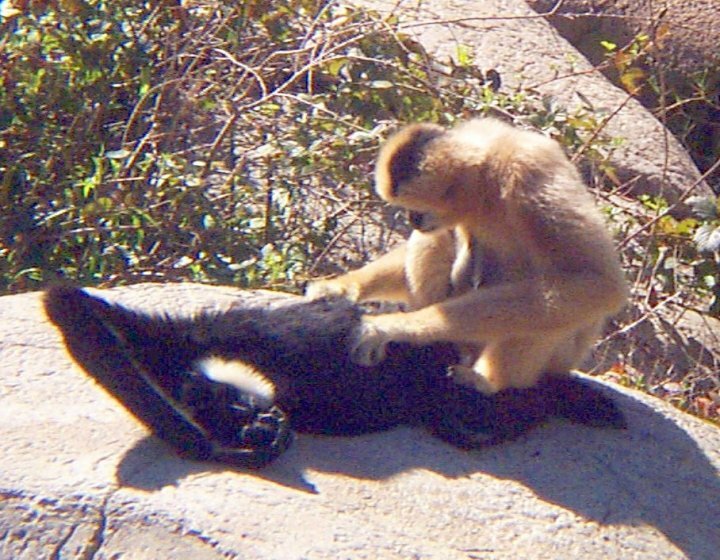 Most gibbons form monogamous pairs, and the social unit is a small family consisting of the pair and immature (6 years old or younger) offspring. 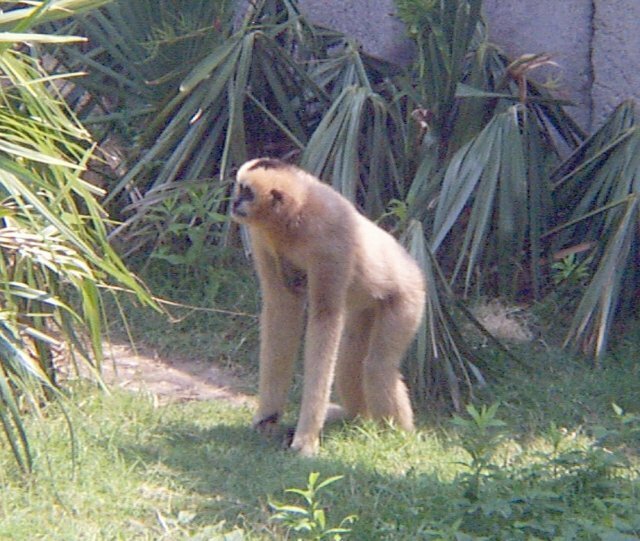 The crested gibbon, however may form family groups that include several adult females. Females bear a single infant every 2-3 years. Infants are born buff, darken to black over the first six months and then assume their adult color on maturity. Related animals may feed together at rich food sources, but individuals and families otherwise forage alone, coming together occasionally to groom, rest, or (at night) sleep. Their calls are loud and musical, with a throat pouch resonating the call in males. Daily calling, which begins on waking, maintains pair bonds and warns other family groups away from the territory claimed by a pair. 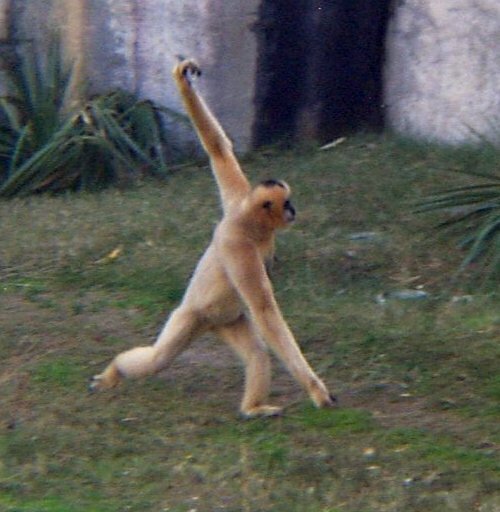 The average home range for a pair of gibbons is about 8.5 acres, but varies from family to family. Boundary disputes arise about once every 5 days, and are resolved, usually without injury, by aerial displays, whooping, and chasing. Because of their small size and soft hair, gibbons look deceptively docile. As youngsters they are soft, fuzzy, and fun to play with. However, as they mature, at about 5 years, they become aggressive and can inflict severe injury with their canine teeth.